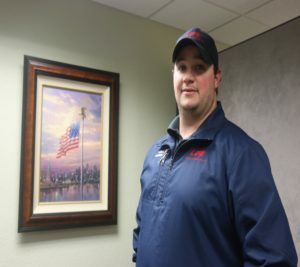 Derek began his career in EMS in 2010 as an EMT Basic with the Watonga, Oklahoma Fire Department. Shortly thereafter, Derek was deployed to Iraq and Kuwait in the 45th Infantry Division for Operation Iraqi Freedom. In 2011–2012 Derek was redeployed to Afghanistan for Operation Enduring Freedom. Upon returning in 2012, Derek enrolled in Paramedic school at Redlands Community College, completing his degree in 2014. Derek started working at Life EMS in August of 2015, and has since been promoted to the position of Operations and QA Supervisor. Derek was instrumental in implementing Life EMS’ new mapping system software and played a key role in rebuilding the Volunteer rural Service in Watonga to prevent it from closing. Derek was chosen as a Star by his fellow medics. Derek’s passion and pride in his work at Life EMS and Watonga EMS is truly unprecedented. Life EMS is proud to recognize Derek Vermillion as a 2017 Star of Life.